Harvard Law School professor and consumer advocate Elizabeth Warren will speak tonight before former President Bill Clinton at the Democratic National Convention (DNC) in Charlotte. 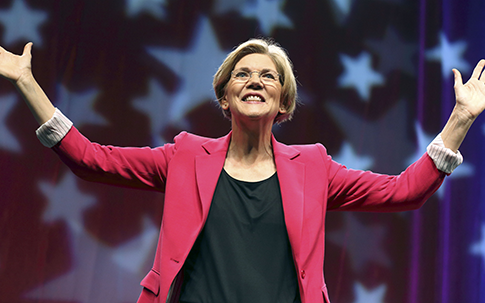 Warren is running for a U.S. Senate seat in Massachusetts on a platform calling for between $1 trillion and $3.4 trillion in tax hikes, and an ideology that "there is nobody in this country who got rich on his own." Warren has a number of skeletons in her closet, including close links to radical left-wing pressure groups and a record of helping corporate interests suppress asbestos liability lawsuits. "I'll be talking about working families. That's mostly what I'll be talking about," Warren told a reporter in Charlotte when asked about her upcoming speech. Warren’s daughter Amelia Warren Tyagi is the founder and chairwoman of Demos, a progressive George Soros-funded New York City think tank that has actively supported Warren for years and whose stated aim is "rethinking American capitalism." Demos recently sued to force the state of Massachusetts to send voter registration forms to 500,000 beneficiaries of state financial support, an effort that will cost Massachusetts taxpayers $276,000. Sen. Scott Brown said the lawsuit was "clearly designed" as a strategy to help the Warren campaign. However, Demos appears to be disguising its radical agenda since publicly affiliating itself with the Warren campaign. "We’ve been undergoing a strategic reassessment," a Demos spokeswoman told the Free Beacon. "That’s all—we’re just reassessing our messaging as an organization. It’s a periodic reassessment. Nothing substantial." Benjamin Barber, a former adviser to Saif al-Islam Gaddafi, the son of the late Libyan dictator Muammar Gaddafi, was listed as a senior fellow at Demos as late as May 2012, when the Free Beacon first reported on the organization’s support for Warren’s political career. Barber is no longer affiliated with Demos. "The switchover occurred in July," Barber’s assistant Harry Merritt told the Free Beacon in regard to Barber’s move to the City University of New York after five years with Demos. "I think that has to do with the restructuring," the Demos spokeswoman said of Barber’s departure. Most fundamentally, a sustainable, just, and democratic future requires rethinking American capitalism as it exists today as a system of political economy. If we are going to care for people and the planet, large-scale changes are needed in how Americans consume and live, how the United States structures economic activity and measures progress, and how we engage in the global economy. Working at the nexus of economic and social policy, Demos is advancing reform to strengthen the middle class and to create a path to economic prosperity for young Americans and future generations. We choose issues that focus the media and legislators on the struggles common to millions, and we show the public that solutions do exist. See our signature work on tomorrow’s middle class. The Demos spokeswoman denied that the "reassessment" is related to the think tank’s efforts in Massachusetts. "That, I know, is not correlated in terms of grant funding and whatnot." 2. "The most lethal substance"
Warren accepted more than $100,000 in legal fees to help suppress personal injury lawsuits against her client Travelers Insurance, which was alleged to have mislead the public about the dangers of asbestos. Warren worked as a consultant for Travelers in the 2009 Supreme Court case Travelers Indemnity Co. v. Bailey, in which Travelers won immunity from all lawsuits related to its bankrupt former client Johns Manville Corp., an asbestos manufacturer. Travelers knew about the dangers of Johns Manville’s product for decades, records show. Warren wrote in a Supreme Court brief about the "asbestos litigation crisis" and criticized "enterprising plaintiffs’ lawyers" representing the asbestos victims. Travelers won the case, effectively shielding the company from any and all future lawsuits by asbestos victims. According to a 2006 statement by the late Democratic Senator Edward Kennedy, whose former seat Warren now seeks, "The real crisis which confronts us is not an ‘asbestos litigation crisis,’ it is an asbestos-induced disease crisis. Asbestos is the most lethal substance ever widely used in the workplace. All too often, the tragedy these seriously ill workers and their families are enduring becomes lost in a complex debate about the economic impact of asbestos litigation. We should not allow that to happen. The litigation did not create these costs. Exposure to asbestos created them." Amid accusations that Warren may have exaggerated her claims of Native American heritage in order to win teaching jobs at the University of Pennsylvania and Harvard University, new revelations came to light about the quality and substance of her academic work. Warren graduated in 1976 from Rutgers School of Law-Newark, the lowest-ranked law school from which any Harvard Law School professor has graduated. During her early career, Warren taught at Rutgers, the University of Houston, and the University of Texas School of Law while also working as a research associate. During this time she produced only two full-length academic works: a "published grant application" with two co-authors that is listed in the National Science Foundation Archives as "Funded Proposal #8310193" and a popular-market teachers manual. 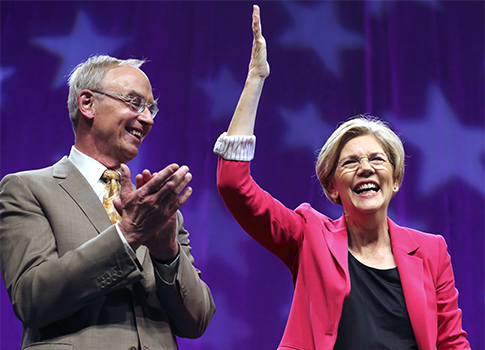 After identifying herself as a Native American, Warren began teaching at the University of Pennsylvania School of Law in 1987—the same year her second husband, current Harvard Law School professor Bruce Mann, also joined the faculty there. Warren divorced her first husband and the father of her two children, Houston engineer Jim Warren, in 1978. She married Mann, a visiting professor of law at the University of Houston Law Center, where she was teaching, in 1980. Warren has long been criticized for her association with Occupy Wall Street after she stated she "created the intellectual foundation for what they do." 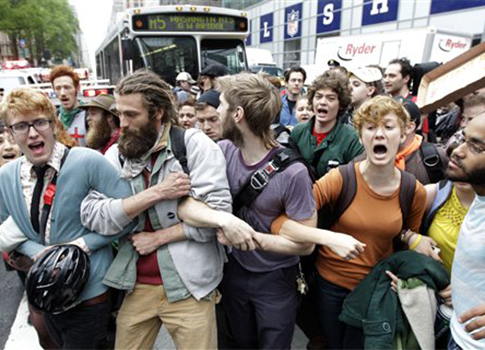 The Occupy movement has frequently been accused of causing violence and public disruption and for publicizing anti-Semitic sentiments in their anti-capitalist demonstrations. Warren, who has fundraised with George Soros in New York City, also received the endorsement of entertainer and activist Harry Belafonte at a Manhattan fundraiser April 19 at the home of HBO executive Michael Fuchs. Belafonte is a supporter of the Castro regime who has previously encouraged Occupy protesters in Zuccotti Park. "I’ll do everything I can in this context to help make this rebellion pay off," Belafonte said at Occupy Wall Street in October 2011. 5. 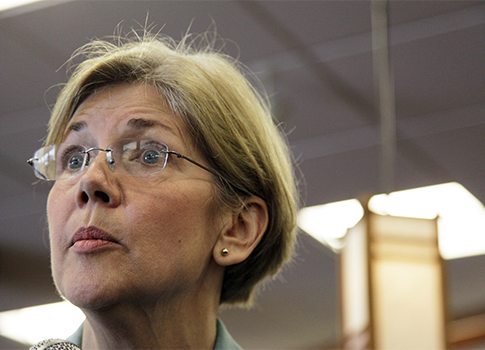 "We Are All Racist"
Warren’s career at Harvard Law School has drawn scrutiny. 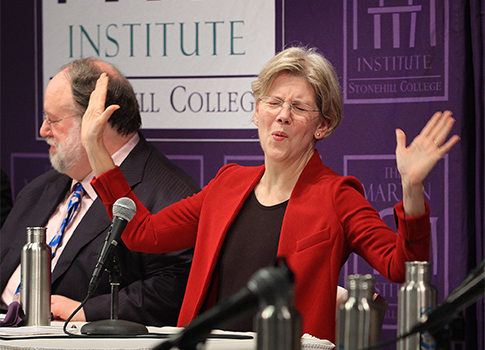 Warren earned more than $350,000 per year for teaching one Harvard class twice a week. Despite her campaign’s focus on the rising costs of college tuition, Warren’s salary alone could have paid for seven students to attend Harvard Law School, according to the Boston Herald. 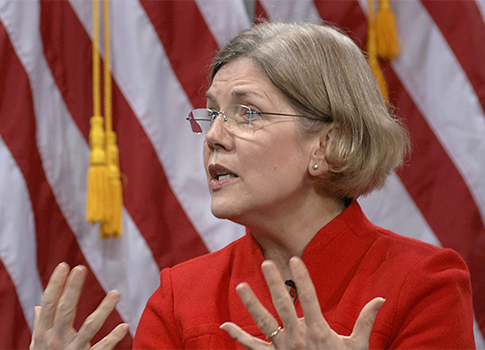 Warren’s Harvard career has also generated controversy for her radical leanings. Warren spoke at a 2004 symposium on critical race theory, entitled "Critical Race Theory: The Next Frontier," alongside a coterie of academics who have advocated for corporate and government reparations for African-Americans, criticized the concept of U.S. citizenship, and accused the United States of operating under a system of "apartheid." "We are all racist. This is what we inevitably inherit. We are all inherently biased. I believe the people who run corporations are biased, particularly against African-Americans," symposium attendee Cheryl L. Wade told the Free Beacon in June. "Elizabeth Warren was one of the outstanding speakers" at the symposium, attendee Steven A. Ramirez added. This entry was posted in Politics and tagged Democratic Party, DNC, Elizabeth Warren, Media, Occupy Movement, Patrick Howley, Progressive Movement, Scott Brown. Bookmark the permalink.